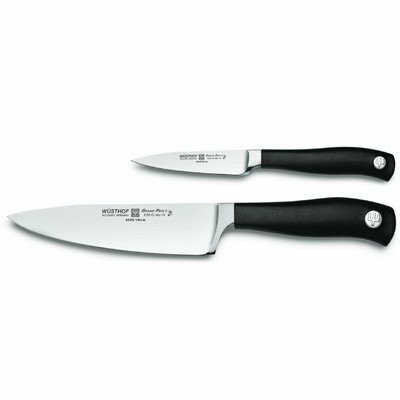 You get two essential knives in the Wusthof Grand Prix II 2 Piece Knife Prep Set. The paring knife gives you close control for peeling, decorating, and mincing. The cook's knife is a must-have for any cooking enthusiast. Both are perfectly balanced and feature Wusthof's precision edge technology for long-lasting, impressive sharpness. The blades are crafted of tempered high carbon steel with seamless black synthetic handles. While these knives are dishwasher safe, we recommend hand washing as you would with any fine cutlery. Forged from a single bar of high carbon steel. Seamless black synthetic handle. 2-piece knife set perfect for any kitchen. Dishwasher safe. Lifetime manufacturer's warranty against workmanship defects. Set includes 3.5-in. parer, 6-in. knives.